This peeled beans porridge looks like Ukwa (Breadfruit), a delicacy from the Eastern Nigeria of mostly the Anambra extraction…mouthful explanation just to explain a dish. It is also a highly proteineous meal and requires little or no ingredients to make a simple version, just like beans. Ukwa is normally expensive, so it is mostly eaten as a special delicacy. I started making this peeled version of beans when I noticed the back of the beans does not digest in my baby’s system. I peeled some beans to make Moimoi and it occurred to me to cook some. The outcome was really lovely and delicious. Adults are not exempt from eating this porridge, when they can eat moimoi, also made from peeled beans. So, you can make this as a baby food or just as another way of cooking beans for the family. You might even get your ‘fussy eater beans hater’ to start liking beans. 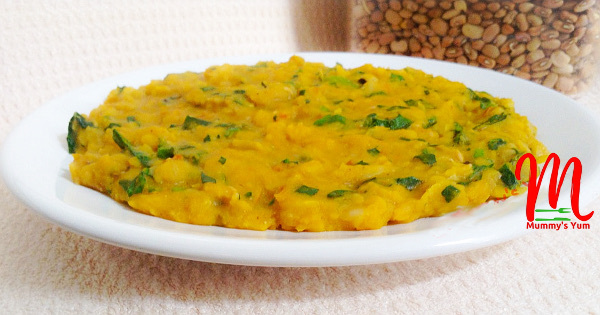 Take it a step higher by adding sweetcorn or ripe plantain, cooked with it or fried as a side. you can also add flaked fish or whole fish to make it more nutritious. Get more pictures of other ways to enjoy beans on Mummy’s Yum Instagram and Facebook pages. 1 seasoning cube, salt and pepper to taste – Omit for purely baby food. Put beans in a pot and add water up to the level of the beans. Add the chopped onions then put on heat and boil. Try not to cover your pot completely because once it starts boiling it will bubble and spill over. Cook until beans is soft and do remember to keep topping up the water level while it’s cooking. Add palm oil, crayfish, seasoning and pepper, if using. Stir and check for taste before adding the salt. Reduce the heat and allow it to simmer for some minutes. Finally add the chopped vegetable, stir and remove from heat. The vegetable will cook well with the heat fro the pot. Love this recipe? Join the mailing list and have recipes and more delivered right to your box. Drop a comment below, share with friends, like and follow on Facebook, Instagram, Twitter and Pinterest. Do you want to share one of the recipes you tried with us, then tag us on Instagram and get it re-posted. Thanks a great deal. Just prepared it for my baby who relished it. Great Chidimma. I’m happy with your feedback. Just made my own Ukwa beans today with sweet corn and it was delicious….and above all my hubby loved it.all tanks to Anty chi. Onyii, I’m glad you all like it. Yes, the sweetcorn is very delicious with it too. Thanks dear for the feedback. Can you tell me how you peel your beans? Please. I use my food processor to peel and it is very easy. I think some bloggers have a video of how to peel beans with food processor or blender if you do a Google search. Thanks so much Funmilayo, I really appreciate your comment. Personally, I do try most of these foods with my baby as she turned 7months but in little bits especially the ones tagged ‘baby food. So, it is up to you to start introducing them but seek your doctor’s advice first.